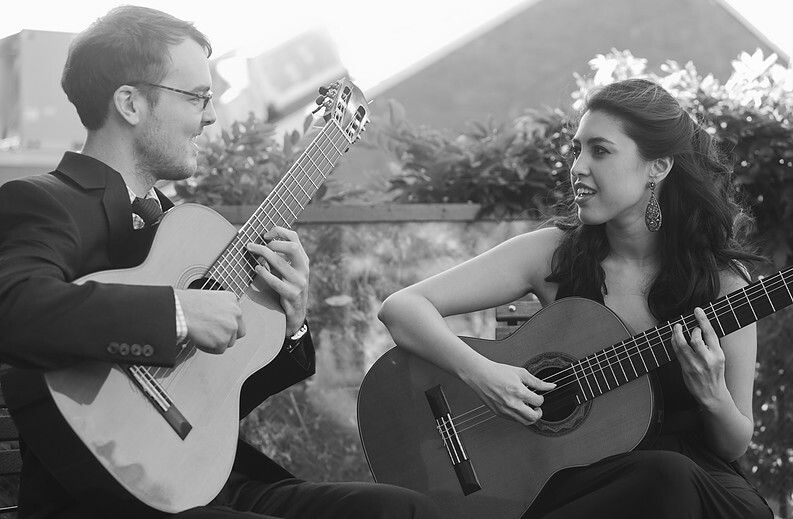 One Great City, featuring two protégés of Sergio Assad and hailed as rising stars of the San Francisco chamber music scene, perform a duo classical guitar recital at Sonoma State University Feb. 5 at 7:30 p.m. in Schroeder Hall at the Green Music Center. The duo is San Francisco Conservatory of Music graduates Alexandra Iranfar on guitar and soprano, and Timothy Sherren on guitar. "I was one of the judges at the classical guitar competition at the San Francisco Conservatory of Music last year and I fell in love with their playing," says Sonoma State studio guitar instructor Eric Cabalo. "They have a very eclectic range." One Great City presents a unique listening experience combining standard guitar repertoire, commissioned works and arrangements featuring guitar and voice. Two works by San Francisco composer Eric Choate, "The Bells" and "A Dream Within a Dream," were composed specifically for One Great City Duo, as was the two-movement Guitar Duo by New York-based composer Shahab Paranj. Tickets are $8 and free to SSU students. To purchase online visit tickets.sonoma.edu.